Dispatchers and drivers can easily follow the turn-by-turn directions using the Routing option in StreetMap Premium. Accurate street data can mean all the difference—it can save lives as well as money. Access to accurate street data is critical for any organization that must move people and/or products safely and on time to locations across the United States or around the world. This type of data is available from Esri. Strong partnerships with leading street data providers, such as TomTom, HERE, and increment P Corporation (iPC), enable Esri to offer street data for key geographies around the world. 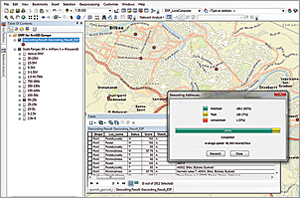 StreetMap Premium for ArcGIS is an out-of-the-box, on-premises data product that users can deploy rapidly behind the firewall. This turnkey product is designed to support GIS applications delivering multiple business functions across departments, organizations, or enterprises. 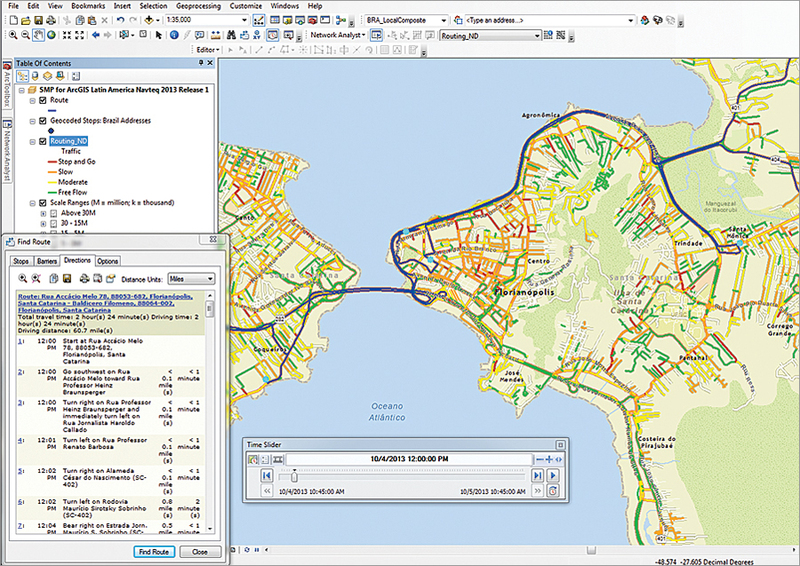 ArcGIS for Desktop and ArcGIS for Server can use StreetMap Premium as a source for ready-to-use, enriched street data for map display, geocoding, routing, and historical traffic data. StreetMap Premium for ArcGIS comes with a map document that contains prerendered layers at multiple scales. Each group layer contains thematic group layers such as Places, Roads, Boundaries, Hydrology, and Landmarks. This scale-dependent approach to layer organization categorizes all the layers of the same scale range contained within a single group layer. Thematic group layers can be easily expanded to show the various datasets available at that scale so that an entire group layer or a particular layer within a group can be turned on or off with a single click. The Geocoding option in StreetMap Premium geocodes a greater percentage of records more quickly. Dynamic label placement is used throughout the entire map document. The labeling is scale-dependent and based on size or importance. For some layers, label classes have been defined but are not turned on by default. StreetMap Premium offers this same consistent look and feel no matter which geography is used. A core task for any GIS project, geocoding converts location information such as a street address into spatial x,y coordinates that can be displayed as a feature on a map. The address locators available with StreetMap Premium for ArcGIS enable users to geocode either by a single line or in batch mode and also to reverse geocode addresses. Because a location element is in nearly all data, adding data to a map gives you spatial insight into your market and enables your organization to make better strategic decisions. Even when all location data is not of the same quality, Esri's cascading geocoding capability maps the data as precisely as possible. With points adjusted to the road, you can geocode down to the most precise address location—the building level. Although address structures for foreign countries differ from those of the United States, Esri provides the same geocoding speed and precision for global data as domestic data. The routing component of StreetMap Premium for ArcGIS enables you to manage transportation restrictions more effectively with turn-by-turn directions and route optimization for automobiles and trucks. Detailed road attributes such as physical and legal restrictions and points of interest specific to the transportation industry are included. 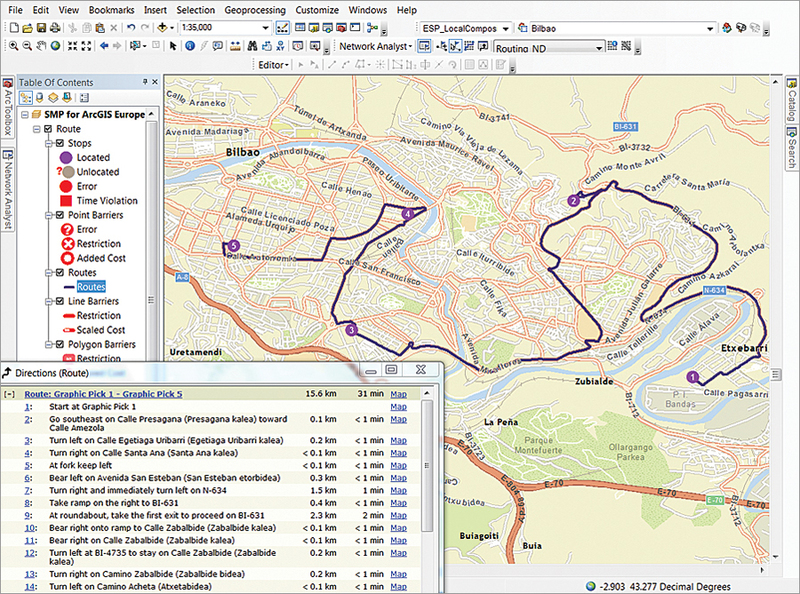 Users can create routes in ArcMap using the Find Route tool or the ArcGIS Network Analyst extension. Route accuracy can be improved by using the trucking restriction attributes or applying historical traffic data (where available). Up-to-the-minute information about traffic conditions provides dispatchers with options for more efficient routing. Historical traffic data is available by day of the week and the time of day to make more accurate arrival time projections or avoid traffic congestion. Information about the average speed of travel for specific sections of roadways is included. 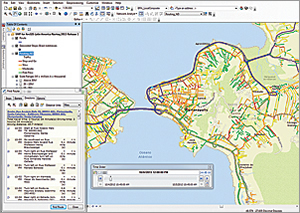 Historical traffic data can be utilized by specifying start times when creating routes using the Find Route tool in ArcMap or the ArcGIS Network Analyst extension. Users can also display the traffic data by using the Time Slider tool. Available impedance options for routing include: Kilometers and Miles (for finding the shortest route distance-wise) and Minutes, TravelTime, and TruckTravelTime (for finding the shortest route time-wise). Using TruckTravelTime, with or without specifying a start time, will use either the truck speed limit or the average speed, whichever is the smaller value as calculated from historical traffic data. Using the Minutes impedance, with or without specifying a start time, will use average speed values previously calculated from the historical traffic data, resulting in quicker performance than when TravelTime impedance is selected, because Minutes impedance uses the actual historical traffic data based on time of day. 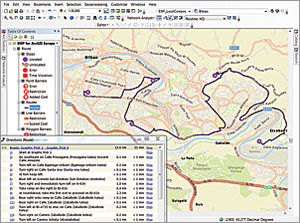 StreetMap Premium can be licensed from Esri annually and added to your license for ArcGIS for Desktop and/or ArcGIS for Server. The flexible licensing model allows you to license StreetMap Premium for ArcGIS based on your GIS needs, the geography desired, and the platform used. 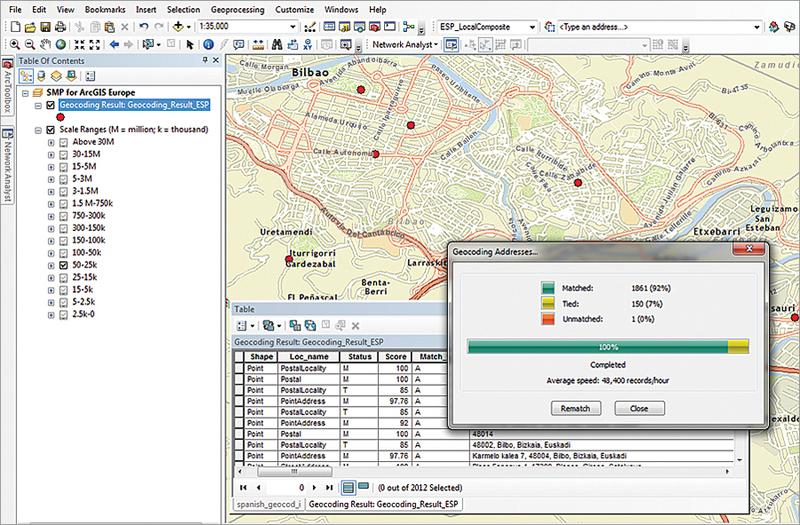 You can choose either Map Display with Geocoding or Map Display with Geocoding and Routing as your usage option. Select the geography option that best fits your needs: State/Province (e.g., California, New York, Quebec), Region (e.g., North America, Latin America), or Country (e.g., United States, Japan). To learn more about how StreetMap Premium for ArcGIS data can help you, call 1-800-447-9778 or visit esri.com/data/streetmap.